Beaten 2013 Heineken Cup finalists Clermont Auvergne ground out a bonus-point win over battling Scarlets in a dour contest. The hosts were 6-3 up at the break with Brock James's penalty double to Rhys Priestland's solitary effort. But Clermont stretched their unbeaten home run to 68 games after tries from Jamie Cudmore, Napolioni Nalaga's double and Clement Ric. Jordan Williams added a Scarlets penalty, and Rhodri Williams a try. The outcome left Clermont top and Scarlets second in Pool 4, albeit with in Nantes in the group's other game on Saturday. In an opening period peppered by stoppages ranging from injuries to technical issues with the officials' communication equipment, the visitors seemed to live up to coach Simon Easterby's view they could cause an upset. But Clermont were twice denied tries by English television match official Graham Hughes. Wing Nalaga was judged to have put a foot in touch under pressure from tackles by Jordan Williams and Liam Williams. The latter was also involved as prop Daniel Kotze illegally disrupted the Scarlets full-back's defensive efforts, again picked up by video ref Hughes. The hosts, who are top of the French Top 14, were guilty of squandering possession and territory amid an often lethargic opening period effort. They also lost former Wales and British and Irish Lions full-back Lee Byrne to injury at the end of the opening quarter, leading to a reshuffle that saw captain Aurelien Rougerie switching from centre to 15. Scarlets were not without their injury quota for the game as Wales prop Samson Lee took a heavy blow to his head in an accidental clash with Thomas Domingo. Priestland had the chance to level as the opening period drew to a close, but his penalty hit an upright. Clermont's try-line frustration was eventually ended when a direct approach led to Canadian former Llanelli lock Cudmore going over. James converted, but Cudmore's score had been followed by some foul play on the Scarlets line and Jordan Williams kicked the penalty from halfway. Clermont moved further ahead after James's cross-kick sent Nalaga over and the fly-half converted. Ex-New Zealand wing Sitiveni Sivivatu provided the scoring pass for Nalaga's next try. The visitors were rewarded for refusing to buckle in the face of Clermont's superiority when wing Frazier Climo sent replacement scrum-half Rhodri Williams over but Jordan Williams missed the close-range conversion. 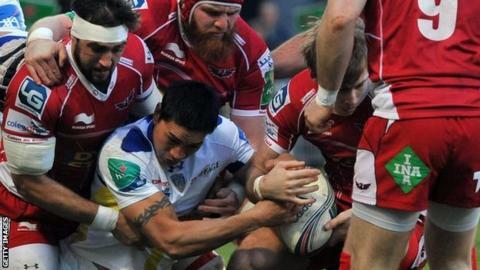 The other effect of the Scarlets scoring was the chance for Clermont to seek the bonus-point try from the restart. The French club reverted to a series of close-quarter drives as they sought that score and it eventually fell to replacement prop Ric to force his way over. The try was converted by another late entrant to the contest, Mike Delaney. Replacements: Nao Nakaitaci for Byrne (19), Mike Delaney for James (72), Ludovic Radosavljevic for Lacrampe (64), Vincent Debaty for Domingo (49), Ti'i Paulo for Kayser (62), Clement Ric for Kotze (59), Julien Pierre for Cudmore (71), Damien Chouly for Lee (64). Scarlets: Liam Williams; Frazier Climo, Nick Reynolds, Scott Williams, Jordan Williams; Rhys Priestland, Gareth Davies; Rob Evans, Emyr Phillips (capt), Samson Lee, Jake Ball, George Earle, Aaron Shingler, Josh Turnbull, John Barclay. Replacements: Aled Thomas for L Williams (69), Adam Warren for Reynolds (57), Rhodri Williams for G Davies (53), Shaun Hopkins for Evans (77), Ken Owens for E Phillips (53), Jacobie Adriaanse for Lee (28), Richard Kelly for Ball (69), Johan Snyman for A Shingler (23).